A monthly Welsh language religious and general periodical serving the Calvinistic Methodist denomination. The periodical's main contents were religious, literary and general articles, alongside domestic and foreign news. Amongst the periodical's editors were its founder, the minister and man of letters John Parry (1775-1846), and the minister and author, Roger Edwards (1811-1886), who serialised three of his own novels in the periodical, paving the way for authors such as Daniel Owen. 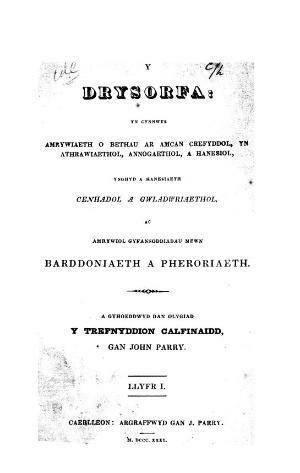 Associated titles: Porfeydd (1969).